August is flying by! I can not believe it is already the 6th! I hope you are having a wonderful summer! I can’t wait for it to be over! I have the baking bug and I am pushing threw these high temps and high humidity to bring happiness to myself, well I am not really eating much of it, my husband takes it to work, so I get happiness from that! This month I, as well as many of you other bakers & cooks out there are celebrating the life, the cook, the baker, the recipe maker…Julia Child! She would have turned 100 this month. So have you honored her memory by baking or cooking a recipe of hers? If not, JOIN IN! I chose to make a French Apple Tart. You will notice the design is a bit different than you see in the book but that’s okay, every other bit is exactly the same. This tart has a delicious flaky, buttery yumminess that you will want to use in all your other tarts. The taste, the texture, all amazing. This is great for the fall season. On a lightly floured surface, roll the dough into a circle about ⅛ inch thick and fit it into a 9-inch fluted tart pan with a removable bottom. Press a little of the overhang against the edge of the pan so that it produces a small ledge protruding over the inside of the pan. The best way to do this is to press the index finger of one hand against the dough running up the side of the pan and use the thumb of the other hand to form the inner ledge by pressing the overhanging dough against the rim of the pan and the top of your inside finger. The ledge will be about ½ inch wide. Press it against the edge of the pan to cut off the excess dough. Now, working with your thumb perpendicular to the bottom of the pan, press against the ledge you've created so that some of the ledge's dough is pressed down against the side of the pan and the rest of it is lifted up above the rim of the pan. Use the back of a knife to decorate the edge by pressing it diagonally at each flute or at ½-inch intervals around the tart. Chilling the Crust Chill the crust for at least 30 minutes. Fit a piece of parchment paper or foil into the tart shell and fill with pie weights, rice, or dried beans. Bake for 20 to 25 minutes, until golden brown. Transfer the crust, with the paper and weights, to a cooling rack and let cool while you make the filling. Lower the oven temperature to 375 F.
Making the Filling Peel and core the apples, cut each one in half, and cut each half into 12 pieces. Put the apples in a large bowl and toss with the sugar, flour, cinnamon, and bread crumbs. Add just a squeeze of lemon juice to start—you'll be able to adjust the flavor later. Spread the apples on a jelly-roll pan and bake for 15 to 20 minutes, or until the apples give up their juices, start to form a sauce, and are soft enough to mash. Scrape the apples into a bowl and mash with a potato masher or a heavy spoon. Don't be overzealous—a few small lumps and bumps will add interest to the filling. Taste and add more lemon juice if you think it needs it, then cool the filling for about 15 minutes. If you have turned off the oven, reset it to 375 F.
Peel, core, and quarter the apples (cutting from end to end), then cut them into slices that are between ⅛ and ¼ inch thick. As you work, toss the slices with the lemon juice to prevent discoloration. Save the smaller pieces from the ends of the apples—they'll make good packing and "even-outers." Working slowly and carefully and starting at the edge, arrange the apples in a circle on the puree. The slices should overlap and the points should just touch the shell. Since these will shrink, make a well-packed circle. Lay on another circle overlapping the first by just about ⅛ inch, tucking a few small pieces under the circle to level it and trimming the slices as necessary so that they fit. You'll probably have enough room for two circles and a center rosette. For the rosette, choose a large, thin slice of apple, cut it into a round, and place it, propped up slightly, in the center of the tart. Or, if your apples were small and the opening in the center is too large to be covered by one slice of apple, arrange as many slices as needed to create an attractive rosette. With a light hand, evenly brush the apple slices with the melted butter (use a feather brush if you have one) and sprinkle with the granulated sugar. Baking the Tart Put the tart on a parchment- or foil-lined jelly-roll pan and bake for 25 to 30 minutes, or until the top is beautifully glazed and the apple slices are edged in black, a stunning effect. Check that the apples are baked through by piercing a couple with the tip of a sharp knife. 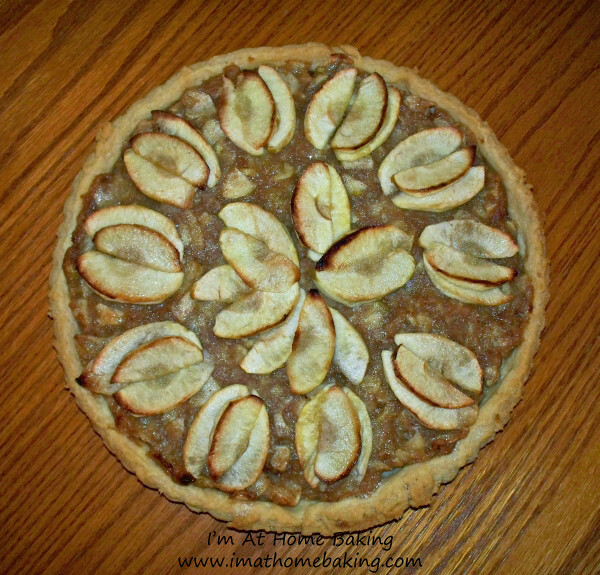 if the apples aren't baked but the tart is very brown, cover the tart with a foil tent and bake a few minutes longer. Transfer the tart to a cooling rack. Just before serving, remove the tart from the pan and dust its edges with confectioner's sugar. Storing This tart is at its prime ever so slightly warm or at room temperature. You can cover any leftover tart tightly with plastic wrap and refrigerate it, but don't expect it to retain its just-baked grace. What a beautiful tart! I am eagerly awaiting apple season so that I can bake with apples. Great way to honor Julia!